Google Chromebit, A Magical Device To Convert Any Display Into Computer! Sensing this major gap in gadget usability, Google has announced the launch of Chromebit, which will be manufactured by ASUS. Priced at $100, it is a dongle which can magically convert any TV into a computer: All you need to do is plug in the device and start it. Now travelers can simply check-in into their hotel room (with a TV), plug in the device into the TV and start accessing internet, data files and do real work, without carrying the laptop and its weight around. Sales executives can simply visit their clients, plugin this device and start presentation without the hassles of checking pen-drives and laptops. 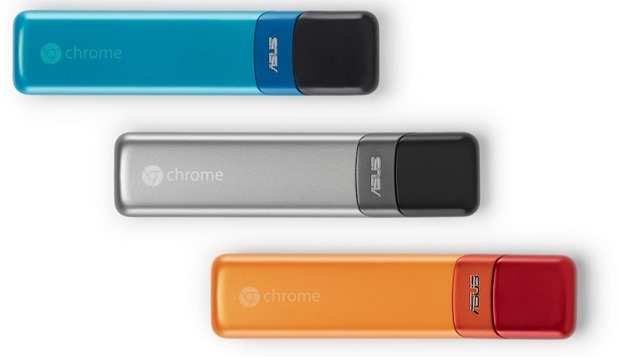 In fact, the size of Chromebit is smaller than a candy bar, and it can be plugged into any display, not just TV. Based on the Chrome OS, this device can be very helpful in educating children in those locations where access to a computer is a challenge. As per the blog published by ASUS, Chromebit is sized little more than a memory stick, and is powered by Rockchip® quad-core processor with dual-band WiFi 802.11ac & BT4.0 support. The device will have a fully functional HDMI port, which can be used to connect with the display such as TV and wirelessly connect with a keyboard and mouse to create a fully functional mobile computer, for just $100. Along with this, Google also announced the launch of cheapest Chromebooks ever: Haier Chromebook 11 and Hisense Chromebook. Haier Chromebook 11 is exclusively available on Amazon, and is priced at $149 (Rs 9238) with free shipping. Powered by Rockchip RK3288 1.8 GHz Processor, this has 2GB Ram and 16 GB storage. Haier is promising 10 hour battery backup, and it provides a 11.6 inch screen. The page announces that the product is not yet released, and customers can pre-order it now. Hisense Chromebook is only available on Walmart, and is also priced at $149 (Rs 9238) with free shipping. Powered by ARM Cortex-A17 Quad-Core processor with 1.8GHz speed, this model supports 8.5 hour battery life, and provides 11.6 inch screen. As per the product page, this is ready to be shipped from April 17th onwards. Chromebooks are unique computers which have been designed only for those who use Internet. The files are not stored on any hard disk, but are available on the Google Cloud. Chromebooks are powered by Chrome OS and Chrome web browser. Here is the original blog post published by Google in May, 2011, announcing the launch of Chromebooks.